Do you have an idea for an event you'd like to see us sponsor? North Kohala Authors Reading Goes Inter-island! 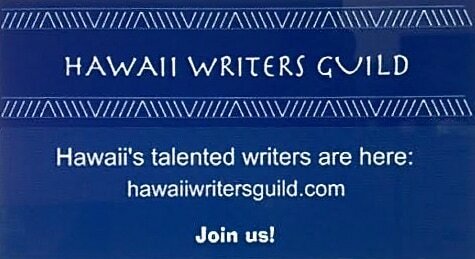 Hawaii Writers Guild now has members on Kauai, Maui and Oahu, as well as the Big Island, and Guild member Eila Algood, host of the North Kohala authors readings, will be including the work of some of our inter-island members in the next reading, scheduled for Monday, March 25 from 6-7:30 p.m. at the North Kohala Library. The work of six Guild authors will be presented at the reading, including poetry by Maui poet Mahealani Wendt. Mahealani's poems will be read by three specially selected local readers. In addition to the regular authors readings, there will be six "pop-up" poets, including one who will be reading a poem by a Kauai Guild member. Altogether, there will be a total of 14 people reading at this event, and the library is moving it to a larger space to accommodate the expected crowd. These events are always popular, and this one is generating even more excitement than usual, so come early to make sure you can find a seat. Hawaii Writers Guild will present its April Writers’ Voices reading on Wednesday, April 3 from 6-7:30 p.m. at the Thelma Parker Memorial Library, 67-1209 Mamalahoa Hwy. in Waimea. Dr. Heather Rivera will be reading from her latest novel, Twice Again, the story of a woman’s unusual empowerment after her death from violent domestic abuse. Although this will be Dr. Rivera’s first time reading at a Guild event, her reading at a recent Kona Stories event was received with enthusiastic approval. Duncan Dempster will be reading from his newly-completed novel, Where are You?, a sequel to his debut novel, Chapel on the Moor. Steeped in mystery, the story unfolds with touches of fantasy. Jada Tan Rufo, who spent 14 years as an English as a second language teacher in China, will read from her memoir Banana Girl, a record of her adventures as an Asian-American woman in a foreign land. Cecilia Johansen, a former host of Writers’ Voices, will read from her recently-completed historical novella, The Captain and the Lady, which demanded a life of its own after starting out as a segment of a historical novel based on Johansen’s ancestors. The event is free and open to the public. Come support your fellow Guild members. Back by popular demand, Guild Member Sam Cudney will be teaching another self-publishing workshop at Thelma Parker Memorial Library in Waimea on Wednesday, April 17, from 5-7 p.m. If you missed Sam's first workshop, and have completed or are nearing completion of your new book, this is a timely opportunity for you to hone your self-publishing skills. The workshop is free and open to the public. Guild Member Louise Riofrio will be discussing her book The Speed of Light at Tutu's House on Thursday, April 18, from 5:30-6:30. Educated in physics and astronomy, Louise wrote her book after working as a scientist at NASA Johnson Space Center in Houston.